Quaint and Quirky: Giveaway Day! Today is Giveaway Day in blogland! The lovely ladies at Sew Mama Sew coordinate a giveaway day each year. This year, my giveaway is a bit of a twist. I figure that many people coming here from Sew Mama Sew probably know how to sew already. So I went in a different direction. I'm giving away a book I made. The book blank I used is from The Paper Source,. I use my version of this book to plan all my sewing projects. The inside is grided, which is great for sketching. It's a perfect size to slip in a bag - not too small OR too big! Details: I will ship to the United States and Canada. International must pay shipping. Please leave a comment telling me your favorite holiday decoration (or just leave a comment if you don't have one). I will choose a winner on December 6th and ship shortly after that! Have fun and happy Giveaway Day! Edited to add: I would love to increase my followers list. When I get to 100, I am going to do another giveaway for anyone on the followers list. Add me? We can be friends! My favorite Christmas decoration is my collection of snowpeople. I put batting snow on my mantel and some book shelves in the hall and turn my house into a winter wonderland. It is the first decorations I put up as the Christmas tree and overtly Christmasy things bring out the scrooge in my wonderful husband. Love the notbook. Would you consider a tutorial? Great little book! My favourite decorations this year are our stockings. We have 2 made by my husband's grandmother, 2 made by my husband's mum, and 1 up made by me! I need to make another one for our son this year. Thanks for the chance. My favorite tree decoration is a set of turtle doves given to us when we were first married. They always stay together on the tree. It's worked for 20 years, and I'm hoping for at least another 20! Thanks for the chance to win such a great giveaway! Beautiful giveaway! And I love your dog!! The rudolph clothespin my daughter made last year:) Lovely prize!! Thanks! My favorite decoration is our tree and all the ornaments and colorful lights. It's one of my favorite things about Christmas. I love this idea! Even if I don't win I think I might copy you, I hope you don't mind. :) My favorite Christmas decoration is an ornament my grandmother gave me when i was a child that pugs into the lights on the tree and it lights up and has a little train in it that zooms around and around. Its so old now that its very loud, but even the noise is soothign to me. That's a neat book. Sometimes, when I'm supposed to be working, I plan sewing projects on scratch paper. What a great idea to have a book to keep it all in one place. My favorite decoration(s) are the ornaments I have been collecting over the years. My mom gives me a new one each year and I love them all! Favorite decoration is probably the Caroling Doll I've had since I was a child. Her hair perfectly matches mine. My favorite decoration is my Christmas pyramid which was handmade in Germany. It has 3 levels of hand carved nativity figures. The heat from the candles makes it slowly spin. Love it...my favorite decorations are the vintage glass bulb ornaments I've collected over the years. and my grandmothes little table top Christmas tree and all her ornaments from it. Thanks so much. My favorite Christmas decoration is definitely the lights! Christmas lights are the best, driving around with hot chocolate, xmas tunes on, and checking out the neighbourhood light show - perfect Christmas evening. 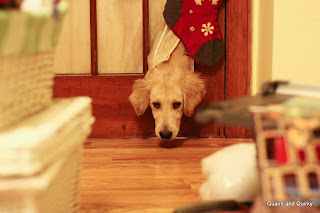 Oh dear your poor door and puppy! He must love you! Anyways, my favorite decorations are the stockings! I love your idea on the book, that is so brilliant! oh, I will add you to my following list! My favourite decoration is a set of brass personalized ornaments that my parents bought as keepsake for my brother and I. Such a great idea. I carry a small spiral that I doodle in. My favorite Christmas decoration has to be the small white lights. Love them on trees, bushes, intertwined with greenery. The simplicity and points of light appeal to me. I'm starting over on decorations as ours were all destroyed when our garage flooded! i do however LOVE that book!! My favorite Christmas decoration is our German Christmas pyramid (like this one: http://www.christkindl-markt.com/nativity-christmas-pyramid-natural-level-p-677.html), which we bought while we lived in England. I love getting to light the candles and watch it spin! Oh, I love that picture of Levi! He's got that adorable half-puppy, half-grown-up face! My favorite holiday decoration is the wreath my friend's daughter makes for me each year. Just lovely. By the way, I love your book! my favorite xmas decorations is simple, classic white lights. i love the way they look at night! I love going through mine and my husband's childhood ornaments every year as we decorate the tree. Oh, I love the book. What a great idea. My favorite thing is our "happy birthday Jesus" sign on the front door. My absolute favorite are the lights. Non-LED, we have some of the latter and I just don consider the glow beautiful. I hang string and icicle lights around living room windows and keep them there until the days are lighter again. All of our tree decorations are relatively new and all are handmade (from swaps and at home). But no one is more special than other. Nice book! My favorite decorations are my snowmen and our Christmas lights! My favorite christmas decoration is a paper lamb covered in glittered that my brother made when he was little. I just love the way it still sparkles after 20+ years! My favorite Christmas decoration is a paper candy cane Josh made in kindergarden that says "To Mom" in crayon and every year it goes on the tree. Truly it does, and its not even laminated. I love the pattern on the paper you used. I am not asking for the blog giveaway, but I did enjoy the eye candy. I love wreaths, they can be quirky, fun, or elegant & traditional. I don't have a favorite decoration besides the one I bought for my oldest daughter who has died. But it's great you are doing a book because I am an office-supply-aholic! Count me in on your giveaway! I really would LOVE to win! I love the book, and I love your dog. what a sweetheart. My favorite decoration as a kid was a blown glass teardrop shaped ornament with a tiny glass whale inside. Thanks! My favorite Christmas decorations are all the ones that my brothers and sisters made as kids (the 'ugly' ones at the back of the tree). These are the ones with the most character & stories behind them! My favorite decorations are those made by my kids....they are so excited to refind them every year. Yea! I love the book. I'm all into sketching inspiration whenever it hits. My favorite decoration is the stockings. I guess that's four decorations. I made them with elvish, pointy, curled up toes with a jingle bell on the end. Then I embroidered our names on them in curly letters and added some fur trim. Last year I bought some snowflake stocking holders and I just love them all together. I guess that's eight decorations. I'm also participating in the giveaway. My blog is Craft Phesine at www.phesine.blogspot.com. I have a wooden angel ornament that has my name painted on it. I've had it since I was a baby. My favorite Christmas ornament is a very old purple felt frog that was given to me by my Aunt when I was 4. Apparently that year I was fixated on getting a purple turtle for Christmas. When ever someone asked me what I wanted for Christmas it was " a purple turtle" That year I got many iterations of turtles (none of them purple, the closest one was green and lavender plaid) and the purple frog. The frog was an instant favorite. The frog is 35 years old now. It is missing an eye, and it used to have little flowers on it, they are all gone too. But every year, no matter what, that frog is on my tree. I love it and always will. p.s. I love your dog he cracks me up, and I'm now following you. I love the little book! That would be very handy for me :) My favorite Christmas decoration is some felt garlands I made- very simple, but they can hang anywhere, and they are really cute! Oh that is an awesome idea!! I would so use that!! My favorite decorations are the ones that we make every year for each person in the family! My favorite decorations are the garlands we hang outside our house each year. They're so lovely. We have a funny gold tinsel chandelier-shaped ornamet that we nicknamed the Flaflugle (or Tatinker). I like the lights, all the lights. Also I like that your book is gridded. Why didn't I think of that? Bay leaf Christmas wreathes are my favorite. I love the book you are giving away. My favourite holiday decoration would be lights!!! They just add that extra bit of sparkle now that it is getting dark out so early. Thanks for a chance to win. 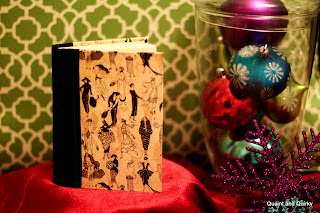 That notebook beats the heck out of my ripped out sheets of graph paper stacked all over the sewing room! It's great! My favorite decorations have to be my kids ornaments that they choose themselves each year. It says so much about their little personality at any point in their development. I'm becoming a follower as well! This is so great - I have a craft notebook but I one with grid paper would be even better. Thanks! Your dog is so cute! My favorite Christmas decorations are always the lights on the house. I love pulling up to the house after my long drive home and seeing the cheerful twinkling! My favorite decoration this year is new for us. We took mason jars and filled them up part way with Epsom salt (to look like snow) and then put a votive candle in them to line the walk way of our house. Simple and lovely. My favorite Christmas ornaments are not actually ornaments at all. They are baby shoes and pacifiers. Yes, I have the first pair of shoes worn by each of my babies and their favorite pacifier tied on with pink or blue ribbon. Now that two of my kiddos are teenagers and all are in school, I really enjoy looking at these sentimental tidbits. That is a fantastic little book! My favorite decorations are little white lights. They work for most Winter celebrations, are classic and simple, and just bring me peace and contentedness. very cute! Thanks for a great giveaway. The book is so cute! I love it! My favorite Christmas decoration is my collection of handmade picture ornaments. Each year I transfer our Christmas picture on a piece of cloth and sew an ornament. my favorite decoration is the tree itself. i could stare at it forever. I love the book and your dog is really cute! My favorite decorations are lights. They seem to make everything fun. That's a really cute book. I think my favorite Christmas decoration is a Christmas tree. Boring, I know! My favorite Christmas decoration is my Advent wreath. A friend made it for me several years ago, and I just love it. My favorite decoration is my mom's village set, it is ceramic and simple and I loved helping her set it up every year. My favorite decoration is Santa in a helicopter on top of a roof. My favorite Christmas decoration is the elf my mom made me. Sooo cute! Best decor, a tree in general. pretty! favorite christmas decoration is my collection of nativities. i love getting them out of the box and setting them out around the house to remind us of christ's birth. I love my little table top tree that the kids get to make stuff for and decorate!!! Great book! I could really use that! I like to make Xmas pieced potholders. I don't actually own any of my own Christmas decorations (I'm freshly out of college and trying to find my way in this whole "adult" thing). Do candy canes count? I loved the rainbow fruity ones as a kid. I have a Christmas ornament of blown glass that looks like a lady in 30s fashion. She's blue and silver and has curls of some very odd fiber. I don't know when I got her or who gave it to me (it one of those that has always been on the tree), but I would be heartbroken if for some reason she wasn't there one year. What a lovely gift. Thank you for your generosity. You can never have too many sketch books! Great giveaway! My favorite decorations are our homemade ornaments on our tree! Ditto on the tutorial idea! I don't have any decorations up! Since I leave to go home for 2 weeks, it seems silly to do the work. My favorite "decoration" back home, though, is the nativity scene we put under the tree. We store each piece wrapped in paper towels so when I was younger, I would have my little brother guess what each piece was before we opened it. Joseph and the standing wise man always got confused. My swedish Christmas cookie tray. what a lovely book! I love our handmade stockings. Oh, what a gorgeous book! My favourite decorations are a rather ugly set of the three wise men. They were my favourites when I was a little girl, and I was so excited when my mom gave them to me a few years ago! My favourite Christmas decoration is a handmade wooden nativity that my mother bought for me at a craft sale when I was a teenager and put away until I had a house of my own. It is very simple, which is probably why I love it so much! Lovely giveaway! My favorite Christmas decoration are the homemade stockings I made of felt for my family. They are decorated with small glass beads and sequins. Don't decorate for Christmas, but do bake cookies - do baking aromas count? I have a cowboy Santa that is about 18" tall that I just love. The hubby has the golfing version that he favors. Thank you for the drawing. Hi there, I started following your blog . . . would love to win the book ;) Thanks for the opportunity! Are you a member of JASNA? My current favorite decoration is the little robot we bought this year... maybe it's because our tree is not up yet so I don't remember properly the other ornaments! I love the journal. 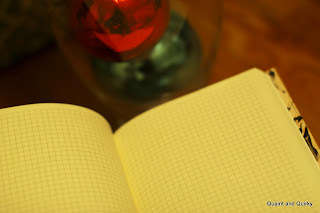 I've seen lots of handmade journals, but the gridded paper inside is a great idea, it would make it very useful. My favorite Christmas decoration is one my Grandma made years ago. She collected costume jewelry arranged it on black felt into the shape of a Christmas tree. Then she wired it with Christmas lights and put it in a frame. I love your cute little notebook. I keep a notepad on my ironing board in the sewing room because sometimes I just need to jot down ideas so I can visualize them better. favorite decortation is our veggie tales nativity set. my 2 year old loves it. though I've had it for like 7 years now. it used to be my favorite decoration, now its hers! I love the tree! and all the ornaments! Cute book! Thanks for the chance to win. My favorite holiday decorations are candles and the ornaments hubster and I have been collecting over our 10 years together! I love the christmas tree, there is nothing better than waking up each morning to the smell of freshly cut noble fir. yumm. My favorite decoration is actually all my ornaments. My mom bought one for every one of my first 19 Christmases, and I've carried on the tradition with my two kids. I love seeing them every year on our tree. I think you're doing okay, I'm comment no. 111 and no. 59 to follow!! I am also a fabric lovin, Austen reading tennis player, who now also loves Twilight and I'm not even close to being a teen. My fave decoration is the tree. I love a real tree that brings nature in and the lovely fragrance. I love this book! I just have a regular graph paper notebook for sketching quilts, but it's so big. I think my favorite Christmas decorations are my nativity sets. I really only have two sets and then a couple of one-piece Holy Families. I'm trying to "collect" more. Thanks for a great giveaway! I would seriously use this all the time. I don't have any specific Christmas decoration, I just enjoy going around neighborhoods and seeing how people have decorated their homes. It just makes me smile. Lovely book! my favorite Decoration is a christmas banner. Lovely! Thanks for the opportunity. hahahhaha I love the picture with your dog! And holiday decorations - we have those village houses from Department 56. But I love wreaths too, I want to try and make one of those ornament ones. Thanks for the giveaway! Fav decoration a wooden lighthouse ornament. Thanks for the chance at the give-away. Merry Christmas and Have a Blessed Day! Our decorations are a mish-mash of what we've collected over the years, but a recurring theme seems to be ducks. Not just regular old ducks, but ducks bedecked in Christmassy velvety goodness. Thanks for the chance to win! My fave decoration this year are the handmade wool scrap wreaths I made with my kids. What a great idea! I'd love to gather my project ideas in one place. My current favorite decoration is a felted wool santa that I got from a local craftsperson. It's adorable! For me, it's all about the lights. Sigh. My collection of manger scenes. Thank you for this wonderful giveaway. Thank you for the opportunity to win. I am a homeschooling mom of 16 years. I have five children from ages 21 months to 21 years. My favorite decorations are the ones I made because I've put so many hours into them and they each have a story behind them. My favorite decoration is a light blue tinsel tree that my mom gave me last year! Love the book!! My favorite Christmas decorations would have to be all of the handmade ornaments my kids have made over the years. Love the book!! My favorite Christmas decorations are all of the ornaments my boys have made over they years. Oh how cute! I love the book! I am always sketching something out whether it be garden plans or a new "pattern". I love our nativity sets! We have them in all sizes to include homemade ones made by our children!! Plus the cheezy plastic ornamtnts we bought for our 1st Christmas tree 20 years ago!! my favorite holiday decoration is a nutcracker. This is a wonderful book! I love the cover! I have some martini glasses on a counter with blue and silver balls in them and I LOVE the way they look! I think that's my favorite decoration! My favorite Christmas decoration is my advent wreath -- made of beautiful white glass beads. THanks for doing this giveaway! this year my fave decoration is our Christmas tree - it's our first year owning a home and 1st time having a tree! so excited. woohoo! I'd love to win this! My husband has been collecting Nutcrackers his whole life, so we have dozens of wooden Nutcrackers lining every bookshelf and tabletop we own. It's so fun to know the story behind each! I have a lighted tree trio that i put up first every year. I love it. This is a great little book! My fave decoration is my tree, because it's the only thing surviving my daughter. thanks for the giveaway! I think you need to find more books to give away. My favorite decorations are the ones my children have made through the years. My favorite decoration is my tree. Thanks for the great giveaway! My favorite decoration at Christmas are the twinkle lights on the trees. Thanks for the chance to win! I love my Jim Shore nativity set. And that book is fabulous! Thanks for the chance to win! What a cute book! My favorite decoration are the lights my husband puts up. He spends the day (sometimes two) working on them and puts them on a timer. The kids get so excited when they pop on every night! My favorite decoration is the ornaments we have on our tree. We pick a special one each year and I often make it. Each one somehow represents the year before. My favorite decoration is this black metal reindeer that I got for Christmas this year. I don't know why, but every time I get it out it makes me feel Christmasy. My favorite decorations are the ornaments made by my kids. Thanks for the giveaway. Outdoor Christmas lights. They make the neighborhood cheery and festive. Mu favorite holiday decorations are some ornaments that my mom made me. I was just a baby, but I have kept them all these years! Your book is so cute! I could really use a new journal- Happy Holidays! I have a Santa with an Irish theme on it that I love. I also became a new follower! I just love my little village. It reminds me of being little and playing with my weebels under the tree. Favorite holiday decoration is probably the tree itself! I really love having a xmas tree all lit up and decorated in the living room! We have all these great shoe ornaments that I think I enjoy the most.